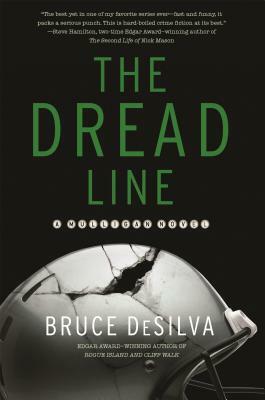 The Dread Line: the latest Liam Mulligan novel from award winning author Bruce DeSilva. Since he got fired in spectacular fashion from his newspaper job last year, former investigative reporter Liam Mulligan has been piecing together a new life--one that straddles both sides of the law. He's getting some part-time work with his friend McCracken's detective agency. He's picking up beer money by freelancing for a local news website. And he's looking after his semi-retired mobster-friend's bookmaking business. But Mulligan still manages to find trouble. He's feuding with a cat that keeps leaving its kills on his porch. He's obsessed with a baffling jewelry heist. And he's enraged that someone in town is torturing animals. All this keeps distracting him from a big case that needs his full attention. The New England Patriots, shaken by a series of murder charges against a star player, have hired Mulligan and McCracken to investigate the background of a college athlete they're thinking of drafting. At first, the job seems routine, but as soon as they begin asking questions, they get push-back. The player, it seems, has something to hide--and someone is willing to kill to make sure it remains secret. Bruce DeSilva's crime fiction has won the Edgar and Macavity Awards; has been listed as a finalist for the Shamus, Anthony, and Barry Awards; and has been published in ten foreign languages. His short stories have appeared in Akashic Press's award-winning noir anthologies. He has reviewed books for The New York Times Sunday Book Review and Publishers Weekly, and his reviews for The Associated Press have appeared in hundreds of other publications. Previously, he was a journalist for forty years, most recently as writing coach world-wide for The Associated Press, editing stories that won nearly every major journalism prize including the Pulitzer. He has worked as a consultant for fifty newspapers, taught at the University of Michigan and the Columbia University Graduate School of Journalism, and lectured at Harvard University's Nieman Foundation. He and his wife, the poet Patricia Smith, live in New Jersey with two enormous dogs named Brady and Rondo. He is the author of Rogue Island, Cliff Walk and Providence Rag.